Eccotemp Portable Liquid Propane Tankless Water Heaters Are Outdoor Installed And Used For Campsites, Cabins, Boat Yards, Beach Homes And More. Eccotemp Portable Tankless Water Heaters are portable to provide instant, endless hot water wherever needed. Ignition is with 2 "D" cell batteries providing off grid use or other areas where electricity is not available. Operating range is 20-80 PSI. 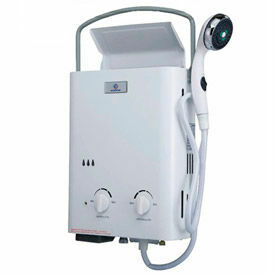 System works with modified water systems such as a 12 volt pump. Available in liquid propane only. 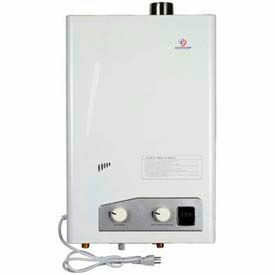 Eccotemp Indoor & Outdoor Tankless Gas Water Heaters Are Used For Small To Medium Hot Water Needs. The Indoor & Outdoor Tankless Gas Water Heaters are liquid propane fired, forced vent, 3.4 GPM indoor tankless water heaters. Used for multiple and simulataneous hot water applications. Used for vacation cabins, cottages, and smaller homes, unit has a horizontal stainless steel vent kit, ready to install. The 120 volt UL listed power cord powers the internal exhaust fan and digital display. It pulls about 2 watts idle and 10 watts during operation, providing energy conservation. The unit has a water pressure activated (40 PSI minimum ) electronic ignition. Available in Liquid Propane - Indoor Forced Vent and Natural Gas - Indoor Forced Vent..